Ek Villain (transl. A villain) is a 2014 Indian Hindi-language action thriller film directed by Mohit Suri. The film stars Sidharth Malhotra, Ritesh Deshmukh, and Shraddha Kapoor. It tells the story of a hardened criminal, Guru (Sidharth Malhotra), whose terminally ill wife, Aisha (Shraddha Kapoor), is murdered by a serial killer, Rakesh (Riteish Deshmukh). The film was produced by Ekta Kapoor and Shobha Kapoor under Balaji Motion Pictures and ALT Entertainment. The film is an unofficial remake of the 2010 South Korean action thriller film I Saw the Devil. Upon its release on 27 June 2014, the film received positive reviews from critics for its theme, screenplay, direction and performances of Malhotra and Deshmukh. It was a commercial success at the box office with earnings of over ₹100 crore in India. The movie starts with Aisha Verma (Shraddha Kapoor) calling her husband and leaving a message for him. A mysterious man in a hood breaks into her house, murders her with a screwdriver, and throws her out of the window. At her funeral, CBI officer Aditya Rathore (Shaad Randhawa) points out to the police that it is vital to track down the murderer or else Guru Divekar (Sidharth Malhotra), Aisha's husband, would go on a killing spree. Here Guru's background is shown in flashbacks, along with how he meets Aisha. Guru, in the past, was a ruthless killer working for gangster Caeser (Remo Fernandes), in Goa, after he joined Caesar's group following Caesar's decision to give Guru a chance to murder the goons who killed his parents. He gets arrested for killing a young man, Debu, but ultimately gets bailed, as Debu's mother, a witness, refuses to testify against Guru. She however warns Guru that one day God would make him pay for his crimes and he will also end up losing a loved one. Prachi Desai in a special appearance in the song "Awari"
The Central Board of Film Certification (CBFC) cleared the film with a U/A certificate after a total of eight cuts designed to tone down the action sequences and mute a particular word. Tanuj Garg, representative of Balaji Motion Pictures stated the cuts were less than a minute of screen time. Sidharth Malhotra, Shraddha Kapoor, Riteish Deshmukh, Mohit Suri and the film’s music directors attended a musical event in Mumbai to promote the soundtrack of the film. Further, Malhotra and Kapoor promoted the movie at the IPL semi finals as well as on reality shows like Jhalak Dikhhla Jaa. Promotion campaigns were also organized across the country in cities like Jaipur, Kolkata and Delhi. As a part of the promotional strategy, a television show based on Bollywood villains was hosted by Malhotra. The songs are composed by Mithoon, Ankit Tiwari and the band Soch. The lyrics are written by Manoj Muntashir, Mithoon and members of Soch. The album consists of seven songs with Tiwari composing "Galliyan", Mithoon composing "Zaroorat", "Humdard" and "Banjaara" while the remaining track "Awari" is composed by Soch. Mohar Basu of Koimoi gave the album 4/5 stars and wrote, "Mohit Suri’s taste for melody cannot be doubted as the filmmaker uses an album that is fine blend of ballads and rock, infusing the right octave of harmony is every single song. In a long time there hasn’t come an album which has such perfectly pitched songs, each of them a winner. Music Directors get all the credit for creating a wholesome album like this." Rediff also awarded the album 4 out of 5 stars and noted, "The music of Ek Villain meets the high expectations that one had from it. Mohit Suri maintains his record of coming up with memorable music for each of his films." Filmfare wrote, "All-in-all, The OST of Ek Villain is another winner for Mohit Suri who has a knack for bringing out the best in his music directors. Go for it if you like soulful romantic tracks with loads of fusion thrown in." Ek Villain was released theatrically on 27 June 2014, in 2539 screens in the domestic market. Ek Villain received positive reviews from critics with praise towards performances of Malhotra and Deshmukh. 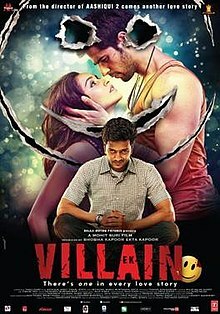 Taran Adarsh of Bollywood Hungama awarded the movie 4/5 stars and wrote that, "On the whole, Ek Villain is a stylish, spellbinding and terrifying edge-of-the-seat thriller. It's a step forward in this genre, without doubt. A sure-shot winner!" Raedita Tandon from Filmfare gave the film 4/5 stars and stated that, "Though indulgent in parts, Ek Villain packs in a punch. Copy of a Korean film or not, it’s ‘good’ paisa vasool entertainment. ." Meena Iyer of The Times of India gave the film 3 stars in a scale of 5, stating that "You cannot fault the scale of Ek Villain or berate its lead star cast. But you wish you could celebrate this thriller like you did Suri's last movie outing Aashiqui 2. This one lacks soul." Aparna Mudi of Zee News gave the film a rating of 2.5/5 stars, concluding her review that "The unveiling of the visceral saga has a lot of strong characters and Mohit has done a good job in adapting a foreign film and complimenting it with the drama that the Indian audience is used to. But he has gone a tad over in making a thriller. Maybe, filmmakers should step out of this trap more often and we wouldn`t be too far from making beacons of world cinema." Rajeev Masand of CNN-IBN stated that "I'm going with two-and-a-half out of five for 'Ek Villain'. If you're still wondering, the real villain here is the lousy script". Shubhra Gupta of The Indian Express gave the film 2 stars, commenting that "Suri is an innate story-teller, and can keep things moving. All he needs is a strong, all-the-way credible, original plot." Saibal Chatterjee of NDTV rated the film 2/5 and wrote that "As a whole, this film, besides its surface flair, does not have too much to fall back upon. Watch it only if that is good enough for you." Raja Sen of Rediff gave the film 1.5 stars out of 5, stating that "Given free tickets, sure, you could escape Humshakals in theatres this weekend with this mediocre effort, but I say do yourself a favour and seek out the Korean DVD. (Uncover it, even.) Now that’s bloody special." Ek Villain had what Box Office India called "very good" opening, with occupancies at around 55–60%. The film earned around ₹167.2 million (US$2.3 million) in its first day and around ₹507 million (US$7.1 million) in its first weekend, collecting around ₹165.4 million (US$2.3 million) and ₹174.4 million (US$2.4 million) in its second and third days respectively. The film collected around ₹81 million (US$1.1 million) in its fourth day and around ₹68 million (US$950,000) in its fifth day. The film collected ₹1.013 billion (US$14 million) in two weeks and around ₹1.056 billion (US$15 million) in three weeks. Box Office India reported that it will earn around ₹1.08 billion (US$15 million) in India alone. The film earned a distributor share of around ₹51 crore (US$7.1 million)(Share). Ek Villain collected ₹132.4 million (US$1.8 million) outside India in its first weekend. Male Vocalist of The Year Ankit Tiwari - "Galliyan"
Lyricist of The Year Manoj Muntashir - "Galliyan"
Upcoming Female Vocalist of The Year Shraddha Kapoor - "Galliyan (Unplugged)"
Upcoming Music Composer of The Year Rabbi Ahmad & Adnan Dhool (Soch) - "Awari"
^ "'Ek Villain' movie details". pagalworld. Retrieved 10 July 2013. ^ a b "Ek Villain - Movie - Box Office India". boxofficeindia.com. Retrieved 16 August 2016. ^ "Food to lingo, India goes on a K-trip - Times of India". ^ a b "'Ek Villain' Movie Review: Watch it for Riteish and Sidharth". International Business Times. Retrieved 29 June 2014. ^ "Ek Villain verdict". pagalworld. Retrieved 27 July 2014. ^ "Sidharth, Shraddha starrer Ek Villain trailer crosses 1 million views". India Today. ^ "Ek Villain Trailer Review: Rustic Sidharth Battling Brooding Riteish Promises A Piquant Film - Koimoi". 28 May 2014. ^ "Ek Villain made Mohit Suri meet Karan Johar Midnight". The Times Of India. ^ "Shraddha Kapoor and Ankit Tiwari sing live at `Ek Villain`s` music concert in Mumbai". 6 June 2014. ^ "Ek Villain (Original Motion Picture Soundtrack)". iTunes. ^ "Review: Ek Villain music is magical". ^ "'Ek Villain' ends 2014 first half on a high!". Taran Adarsh. Bollywood Hungama. Retrieved 2 July 2014. ^ "Ek Villain (2014)- Hindi Movie Critic Review By Taran Adarsh". Taran Adarsh. Bollywood Hungama. Retrieved 29 June 2014. ^ "Movie Review: Ek Villain". Raedita Tandon. Filmfare. Archived from the original on 28 June 2014. Retrieved 29 June 2014. ^ "Ek Villain movie review: Wallpaper, Story, Trailer at Times of India". Meena Iyer. The Times of India. Retrieved 29 June 2014. ^ "'Ek Villain' review: Tad overdone melodrama". Aparna Mudi. Zee News. Retrieved 29 June 2014. ^ "'Ek Villain' review: Moderately fulfilling, the film's real villain is a lousy script". Rajeev Masand. CNN-IBN. Retrieved 29 June 2014. ^ "Ek Villain review: Sidharth Malhotra is watchable even if he has a hard time doing menace". Shubhra Gupta. The Indian Express. Retrieved 29 June 2014. ^ "Ek Villain Movie Review – NDTV". Saibal Chatterjee. NDTV. Retrieved 29 June 2014. ^ "Review: Ek Villain is too silly to thrill". Raja Sen. Rediff. Retrieved 29 June 2014. ^ "Ek Villain Has Very Good Initial". Box Office India. Retrieved 28 June 2014. ^ "Ek Villain Has Excellent First Weekend". India tv news. Retrieved 2 July 2014. ^ "Ek Villain Collects Very Well On Monday". Koimoi. Retrieved 1 July 2014. ^ "Ek Villain Tuesday Business". Koimoi. Retrieved 2 July 2014. ^ "Ek Villain Second Week". Finalcial express. Retrieved 14 July 2014. ^ "Ek Villain". Koimoi. Retrieved 19 July 2014. ^ "Ek Villain". Bollywood Hungama. Retrieved 19 July 2014. ^ "Ek Villain To Fall Short Of 100 Crore Nett". Box Office India. 15 July 2014. ^ "Kick Makes It Two 100 Crore Share Films For Salman Khan". Box Office India. 8 September 2014. ^ "Bollywood Box Office – Overseas: 'Ek Villain' surprises, 'Humshakals' crashes!". Bollywood Hungama. Retrieved 1 July 2014. ^ "MMA Mirchi Music Awards". MMAMirchiMusicAwards. Retrieved 27 March 2018. Wikimedia Commons has media related to Ek Villain. This page was last edited on 6 April 2019, at 16:54 (UTC).